Are you artistic, dexterous, and meticulous? You might like beading, model ships, or silk-screening. Are you independent, nature-loving, and outdoorsy? You might like birding, fly-tying, or mushroom hunting. 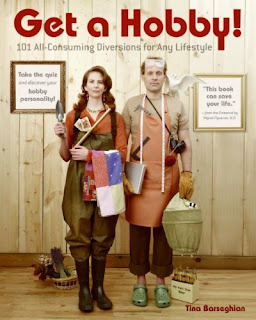 You'll have to get a copy of the book to take the quiz, but if you think you already know your most prominent characteristics, here are a couple of hobby ideas from Tina Barseghian's book for you to take on! Click on the trait list that best describes you to find a hobby-related item from our catalog. You might find you have an aptitude for something unexpected! artistic, crafty, dexterous, independent, meditative, patient? artistic, crafty, independent, meditative, meticulous, nature-loving, nurturing, patient? crafty, dexterous, outdoorsy, sporty, technical? dexterous, extroverted, independent, social, technical? animal-loving, dexterous, independent, meticulous, outdoorsy? For more hobby personalities, you'll have to check out the book!